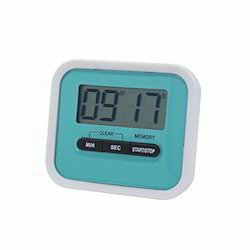 Wholesale Trader of a wide range of products which include digital timers. We are involved in manufacturing, trading and supplying of Timers Mechanical/Digital. This is a specialized machine known as stopwatch for depicting elapsed time duration. Stop watches use digital or mechanical technology for displaying the time remaining. A digital stopwatch display the start and remaining time on the LCD screen. Components of a stopwatch are LED/LCD screen, mechanical/digital machine and control buttons. Timers Mechanical/Digital being offered by us are widely used in Sports, Cars, Washing Machines and Music systems. Looking for Timers Mechanical and Digital ?